Learn about the early stages of planning for a branch on the east side of Waterloo. The Waterloo Public Library (WPL) is excited to announce that a new library branch on the east side of Waterloo is one step closer to becoming a reality. In a unanimous decision last night, Waterloo City Council voted to approve to move towards the construction of a fourth library location by proceeding to detailed design, as part of the RIM Park Manulife Financial Sportsplex and Healthy Living Centre. After completing an extensive feasibility study and a series of public engagement exercises, WPL and City of Waterloo staff presented a report to City Council recommending the approval of the East Side Library Feasibility Study and proceeding to detailed design in anticipation of construction funding for a new East Side Branch Library to be considered as part of the City’s 2019 budget process. “We are truly thrilled to be able to move forward with this new branch, and we thank the City of Waterloo for their collaboration and support”, said Laurie Clarke, Waterloo Public Library’s CEO. Also approved was a new Funding and Operating Agreement between WPL and the City of Waterloo, which will be in place for 10 years. This agreement provides a sustainable funding model for the three existing branches. Funding for the fourth branch has been identified and will be added by the City of Waterloo as an additional amount in 2020, when the East Side Branch Library is proposed to open. Waterloo Public Library currently has three locations, including the Main Library in Uptown Waterloo, the John M. Harper Branch in Laurelwood and the McCormick Branch in the Sunnydale neighbourhood. See more images of the proposed East Side Branch Library here. Since 2015 , the Waterloo Public Library and the City of Waterloo have been working in partnership on the East Side Branch Library Project. To plan for East Side Branch Library service, the Waterloo Public Library Board commissioned Lighthouse Consulting in 2015 to undertake a needs assessment. The goal of the study was to engage the community to articulate their vision for the proposed East Side Branch Library and Main Library. This was achieved through focus groups and an online survey. Recurring themes for the East Side included strong emphasis on technology-based programs and services, inspiring space to meet and gather, tween/teen space, accessible location, free parking and opportunities for community based partnerships. On June 20, 2016, City of Waterloo Council approved the RIM Park Manulife Financial Sportsplex and Healthy Living Centre as a preferred location for a potential new East Side Branch Library, the specific location, design and building amenities to be determined via ongoing review, a Feasibility Study including but not limited to schematic/conceptual design options, and public engagement. 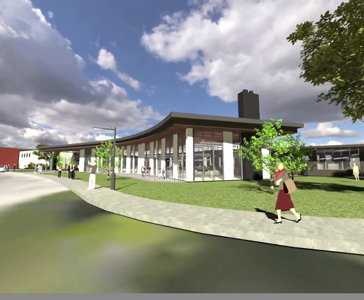 The East Side Branch Library project team (comprised of WPL and City staff members) has been working collaboratively with studioCANOO to advance the Feasibility Study. Based on the work to date, the project team is recommending that an approximately 11,500 sq.ft, one-storey, building addition and approximately 2,200 sq.ft renovation of existing space (total Library floor area of approximately 13,700 sq.ft) on the east side of the RIM Park Manulife Financial Sportsplex and Healthy Living Centre be advanced to the conclusion of the Feasibility Study.